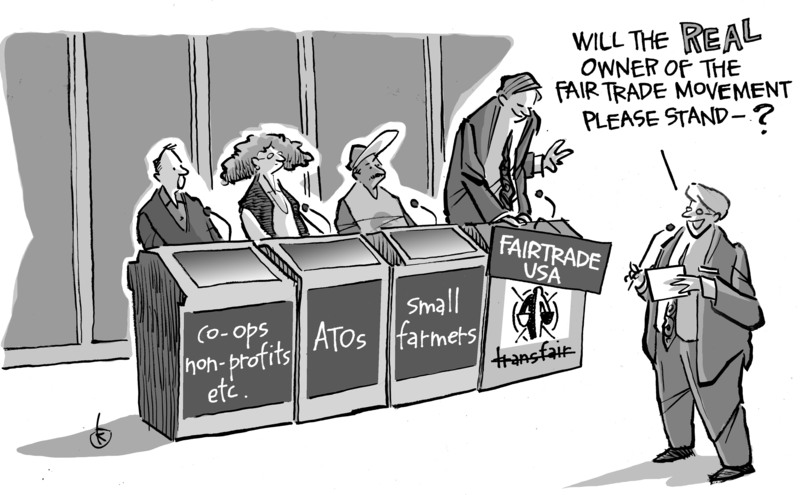 To Tell the Truth: Who Owns Fair Trade? | Small Farmers. Big Change. When TransFair USA announced last fall that it was changing its name to Fair Trade USA, an immediate and on-going tsunami of outrage and indignation burst through the Fair Trade community. 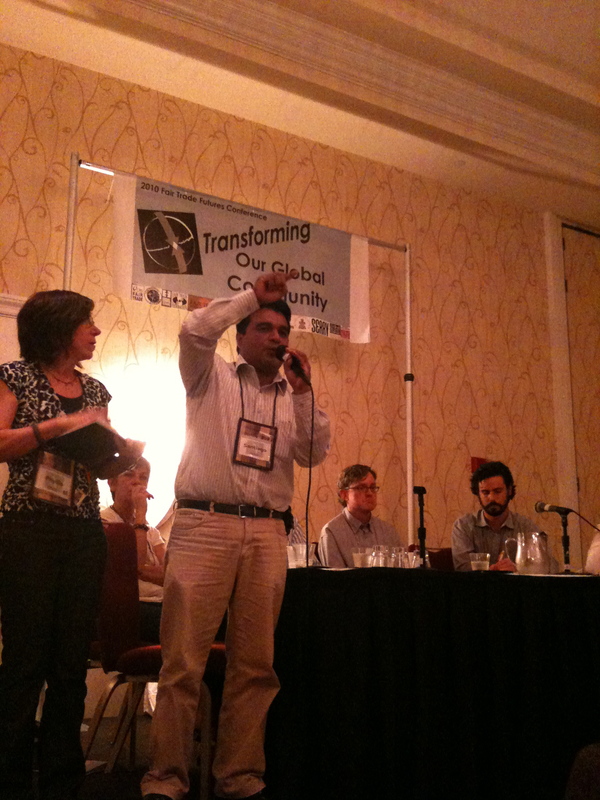 Alternative Trade Organizations, 100% Fair Trade roasters, student, religious, and consumer activists, and non-profit organizations, all of whom have dedicated themselves to the difficult but critically important work of building market access for small farmers across the globe, were affronted. How could any single organization, a certifying agency no less, claim the name Fair Trade? Fair Trade is a concept, a way of doing business, a value system, an entire movement built through the convictions and hard work of hundreds of thousands of individuals across the globe. Can one organization simply appropriate all that “Fair Trade” signifies, and claim it for itself? Reactions to the announcement have differed, but mainly span from disappointment to anger. Some are dismayed that TransFair would undertake such a divisive move, thereby attracting bad publicity and potentially hurting those for whom Fair Trade is most supposed to benefit. Others are more indignant, seeing this step as one more in a long line of “corporate-like attitudes and behaviors” that blatantly disregard and steamroll over the legitimate concerns of others in the movement. Still others give TransFair credit for devising such a bold marketing move: just when your organization is encountering growing public relations challenges, rebrand yourselves so that the average consumer makes the assumption that your organization and Fair Trade are one and the same. It is interesting that the move comes at a time when criticism of TransFair’s approach and its actions has never been higher. In fact, the name change coincides with the recent decision this past year of many organizations, including Equal Exchange, to drop the use of the TransFair logo on fairly traded products, in favor of the IMO (Institute of Market Ecology) “Fair for Life” certification. Not only does the departure of many of the original “100% Fair Traders” signal growing discontent with TransFair, but since companies must pay each time they use the TransFair logo on a product, discontinuing use of their seal also carries financial impact. For the first time, companies finally have a choice between Fair Trade certifications. It is no wonder that TransFair took this moment to try and become Fair Trade USA. But at the end of the day, why make such a fuss over a name change? I mean honestly, does it really matter what Transfair calls itself? Should we really be getting worked up about the preferences of one certifying agency? Aren’t there far more pressing issues going on in this country and in the world right now that deserve our attention? Much of the anger and resentment surrounding TransFair’s name change results from their long history of overlooking and undermining the interests, opinions and values of others in the movement. Coming as it has after a long line of far more serious and consequential actions over the past decade, this appropriation of the name Fair Trade, is considered by many to be the proverbial “last straw.” The real disagreement, between TransFair and others in the movement, however is much more than symbolism. It is about divergent views of the mission, the underlying values of Fair Trade, and the strategies employed to fulfill that mission. At stake are the fundamental questions: who is Fair Trade meant to serve and how should it best do so? The roots of Fair Trade began in Europe after World War II as a faith-based initiative to help provide livelihoods for eastern European war refugees. Non-profits, such as Oxfam, with an interest in alleviating global poverty, worked to create markets for the refugees’ products. In these early days, “fair trade” followed a charity, or solidarity, model where the disadvantaged received market assistance. Meanwhile, small farmers In the Global South, historically marginalized and without access to social services, infrastructure, credit, markets, or technical assistance, were organizing themselves into co-operatives as a means of survival. In response, by the mid-70s, a new wave of businesses in Europe, called Alternative Trade Organizations (ATOs), sprang up with the philosophy, “Trade Not Aid.” They believed that market access was not something to be done out of charity, but rather, that Fair Trade was a right. The ATOs saw the farmer co-ops as equal partners; that work needed to be done in both the North and South in order to create a new system of trade that would benefit producers and consumers alike. In the mid-1980s, Equal Exchange’s founders created one of the first Fair Trade organizations in the United States to work with food products and small farmer co-operatives in the Global South. Like its allies in Europe, Equal Exchange’s philosophy is deeply rooted in the conviction that the conventional trade system is unfair and that the mission of Fair Trade was to support small farmers, educate consumers, change business practices and ultimately create a new system of trade based on dignity, respect, and empowerment. This was not charity; it was structural change. And so, the ATOs, Fair Trade coffee roasters, food co-operatives, social justice non-profits, interfaith organizations, students and other activists began the difficult work of growing a movement and opening markets for small farmer products. Alongside the traders’ efforts to build supply chains and get small farmer products on the grocery store shelves, the activists worked tirelessly to build demand. They educated consumers about the importance of small farmers and the need to change the trade system which disproportionately favored large companies and plantations, marginalized small farmers and kept consumers ignorant about the source of their food and those who grow it. An international body, the Fairtrade Labeling Organization (FLO), was created to certify small farmer co-operatives through a set of social and environmental criteria. In 1998, Equal Exchange, along with other organizations, supported the establishment of TransFair USA, a FLO-affiliate, to serve as an independent third party to ensure and verify that Fair Trade businesses in the U.S. were also meeting a set of Fair Trade guidelines. To participate in the system, and place the seal on a product, each industry pays a fee to TransFair. It wasn’t long before TransFair was courting large multi-national companies, such as Nestle, Chiquita, and Dole, lowering the bar to grow their brand. Providing certification to these companies, with their horrendous reputations, poor labor practices, and minimal commitments to the goals and mission of Fair Trade, has angered many who are striving to uphold Fair Trade to the highest level. Several years ago, TransFair received so much opposition to their attempt to bring Chiquita into the Fair Trade system, it eventually was forced to give up. However, last year TransFair did succeed in quietly getting a portion of Dole’s bananas certified Fair Trade. The certification came at the same time that Dole (and Chiquita) was sued for its documented financial support of paramilitaries in Colombia, responsible for the murders of a number of labor unionists working on its plantations. Last year, both companies made it to the International Labor Rights Forum’s list of 2010’s five worst labor rights abusers. Of all the controversial actions the certifier has taken, it has been TransFair’s work in spearheading the entry of plantations into the Fair Trade system that has earned them the most ire, and probably done the most to weaken Fair Trade. In an effort to grow fast, Transfair and FLO have promoted a whole range of new products eligible for Fair Trade certification. Rather than do the necessary, and very difficult work to create and grow supply chains from small farmer organizations, the certifying bodies have taken the far easier path and certified a whole host of plantation products. It is this “quantity” over “quality” approach which has small farmers, traders, and Fair Trade activists most upset. Fair Trade is about transformation and this structural change only comes about by demanding and growing alternative models to the current system. It requires a commitment to small farmer organizations, to opening markets for small farmers, and to building a network of informed, educated and active consumers. Instead of supporting others in the movement to carry out this work, TransFair and its parent organization, FLO, have put their energy and resources into expanding the brand: not only do they certify multi-national companies whose overall practices do not show a commitment to these Fair Trade principles, but they have moved away from the idea of structural change. In most products aside from coffee, chocolate, and a few others, large plantations can now be certified. In 2003, at the Specialty Coffee Association of America conference in Boston, the contingent of small farmer coffee co-operatives, and their industry allies, went wild when they learned that TransFair was trying to open up coffee and chocolate to plantations as well. TransFair used the argument that workers on plantations also need “assistance”, but the fact remains that while every worker deserves dignity, respect, and labor rights, most plantations have not proven to be change agents. Small improvements, such as the installation of electricity and bathrooms, are services which should be provided by management anyway. Fair Trade is not about small improvements. Worse is that allowing plantations, with all the historical advantages they receive from governments, to compete with small farmer organizations in the same system, will in fact cause small farmers – with their limited resources – and access to technology, credit, infrastructure to fail. And so, if anger over TransFair’s name change has risen over the symbolic nature of the action, the deeper issues stem from its persistent and constant efforts to “corporatize” the Fair Trade movement. As Santiago Paz so emotionally and eloquently put it, what’s at stake is nothing less than the future of Fair Trade; the future of small farmers. Will the real owner of the Fair Trade movement please stand up? A ridiculous idea, of course. Fair Trade is a movement, not a brand. No one has the right to claim ownership over a movement. Just like in the 1970s popular game show, To Tell the Truth, when the panelists must guess which of the contestants can legitimately claim a specific identity, in this scenario, we are all the panelists. It is ultimately up to us to discern whether those claiming to “own” the movement are within their rights. To learn more, or to sign the petition demanding that TransFair cease using the name, Fair Trade USA, click here. Cartoons courtesy of John Klossner, copywrite 2011. Thank you, Phyllis. This is a serious divisive issue, and regardless of its original intentions, Transfair needs to recognize that its name change is simply alienating people, hurting the movement, and creating more divisiveness than they created already through plantation certification. I hope they will listen to the voices or morality and reason and choose a name that is more “branded” than Transfair but not detrimental to the thousands of others are partners in a movement that is ultimately about empowering impoverished rural communities. It is NOT about furthering profits at the expense of values and NOT about making one organization stand out above all others. If Transfair can’t find a name that both furthers the ideal of empowerment of the poor AND does so without overshadowing other partners, then we can only hope partners will “vote” with their dollars and move to other certficating agencies. Until they change there name, I am carrying a list of there products and will not buy anything from them. Thanks Sohaib for your solidarity. I should point out however that TransFair doesn’t actually “have” any products. What they do is certify products; it’s a guarantee that the products that carry their seal meet a specific set of Fair Trade guidelines. The problem is not with those products, it is rather the way in which TransFair goes about its business. In an attempt to expand the system rapidly, they are taking measures which lower the high standards that consumers expect. Ultimately, their actions could hurt consumers, small farmers, and the integrity of the whole Fair Trade system. Thanks again for your passion. You might consider adding your name to the petition which urges TransFair to cease using the name Fair Trade USA. The photo was taken by Jeanie Wells, Equal Exchange and the cartoons were done by John Klossner. great blog / article too…. It’s time for America’s Fair Trade movement to recognize that there IS a difference between the label and the movement. Nevertheless, the TWO are not mutually exclusive and neither will be successful without the other. I’ve been carefully observing the internal debate within America’s Fair Trade community ever since the Fair Trade Futures Conference ended. With this new campaign it seems that there are two choices offered by each of the conflicting parties. The first choice is being promoted by businesses like Dr. Bronner’s, Equal Exchange and others. This choice would be for Fair Trade USA to reverse its decision to change its name from TransFair USA this Fall. The second choice, Fair Trade USA’s response, is to stay the course with the name change and try to steer clear from any more internal conflict. I want to offer a Third Choice for all of those involved. A choice, which I believe, will provide a peaceful resolution for both sides of this conflict. First, let’s look at the prevailing opinions on either side of this debate. On one hand, the campaigning groups argue that the name change indicates an effort by TransFair to “own” the Fair Trade movement in the US. On the other hand, Fair Trade USA responds by stating that they are simply doing the same thing as many other members of FLO, now called Fairtrade International. To help mitigate this conflict I thought I’d share with everyone here an explanation given by FLO about the distinction between “Fair Trade” the movement and “Fairtrade” the label. “Fair Trade” is a movement working to a make trade practice and policy fairer. There are different organisations working to promote fair trade practice and policy, through product certification, advocacy, campaigning and educational work. “Fairtrade” describes the labelling system controlled by Fairtrade Labelling Organisations (FLO) International and national partners in different countries. The FAIRTRADE Mark appears on products that meet Fairtrade standards and come from Fairtrade producer organisations. It seems that everywhere else in the world (in the UK where over 70% of the population knows about Fair Trade and in the rest of Europe as well as Australia, Africa and now even Canada) carefully distinguish between the label and the movement by referring to the label as “Fairtrade,” just one word. And, believe it or not, as simple as one space may seem, all of these Fair Trade movements have avoided the kind of unprogressive conflict America’s Fair Trade movement is currently suffering from largely due to this simple distinction. Sure, FLO and national Fairtrade Labelling organisations ARE involved in the larger “Fair Trade” movement but they admit that they do not own it. Likewise, 100% Fairtrade companies and members of the Fair Trade movement work alongside their fellow FLO initiatives in their respective countries promoting not only the Fairtrade label but also the Fair Trade movement as a whole. Can you IMAGINE this same peaceful and productive movement here in America? I can. All it will take is for ALL parties involved to simply give a little. More specifically my “Third Choice” is for TransFair to change its name not to “Fair Trade USA” but to “Fairtrade USA” and join with ALL the other FLO affiliates around the world. This “Third Choice” would also call on members of this campaign like Equal Exchange and Dr. Bronner’s to stop fighting amongst ourselves with the current campaigns and instead proudly claim the title of “America’s Fair Trade Movement,” a movement that WILL work with and not against “Fairtrade USA” and a movement that WILL always retain it’s sanctity, history, authenticity and sovereignty. So, what do you say? Are we all ready to come together as ONE Unified Fair Trade Family here in the USA? Here you can see the names of other National FLO affiliates… Should we be accusing ALL of these groups of trying to “own” the “Fair Trade” movement? We should be asking ourselves why there are not highly divisive campaigns in these countries. Thanks for your comments and I wish I could say that if adopted, the third path you suggest would create the change in attitudes, and more importantly, practices that would truly change the way our trade system currently works and who it favors. I believe those of us who oppose TransFair’s name change, and the deeper issues underlying the tension that it has (re) surfaced, would happily embrace and wholeheartedly promote it as a solution. ps. for more history and another view on why this option might not be fully sufficient, please see Andy Good’s comment below. Thanks for your reply. I understand your skepticism of my solution offered and I admit that it does not address the greater ideological differences between Transfair USA and 100% commited ATOs. I also respect Andy’s comments as I’m sure he understands the situation with FLO and 100%ers in the UK more than most people, myself included. As a newbie to the Fair Trade movement yet still a well seasoned activist I understand that there are two distinct ideologies within the Fair Trade movement. One focuses on looking at the greater picture, the injustices of the global world trade system. This was, afterall, the very roots of the Fair Trade movement and a very noble goal. Indeed it should be the ultimate goal for all of us in the Fair Trade Movement. The other ideology seems to be more pragmatic, focusing on working within and not against the current system to deliver immediate changes to the current food system. Each of these ideologies has its strengths and weaknesses and I would argue each postion should play a crucial role within America’s Fair Trade movement. On one hand, if we ignore the realities of today and try to pretend like the majority of people in America don’t shop at box stores and buy products from MNOs then we will not succeed at winning over enough of the population for our movement to be successful. Likewise, if we completely lose sight of the long term goal of reshaping the global trade system than we will also not be successful and in “dancing with the devil” we may run the risk of selling out value for quantity and the bottom line. There is no doubt that ATOs play a crucial role in being the pathbreakers of the global Fair Trade movement and they should be applauded for their efforts. Ultimately this is the kind of business model we need to see across the board. Nonetheless, I don’t see it as a productive use of the time, passion and effort of ATOs to be publically attacking Transfair and the FLO system. To the general public in America, over 70% who don’t know what either “Fair Trade” means or who TransFair USA is, in-fighting and conflict will only discourage them or merely overwhelm them enough so they don’t get involved and the Fair Trade movement dies. I am encouraged to hear both from yourself as well as Andy that it seems like most people within the global Fair Trade movement would welcome the name change to “Fairtrade USA” just like so many of the other FLO affiliates around the world. Therfore, I urge all members of America’s Fair Trade movement to continuing doing the great work that you do and to share mutual respect amongst All other members of the movement. Actually, Fair Trade has become a brand, and not because of Transfair’s name change. The moment a “movement” becomes institutionalized it becomes a brand. Fair Trade became institutionalized many years ago. If it wasn’t/isn’t, why all the fuss? The folks who genuinely support the cause still support the cause. A name has no value until someone places value in that name. Transfair (now Fair Trade USA) doesn’t own what fair trade is, it just wants consumers to believe it does. And that’s easily defeated. Fair is a matter of the heart, not of a seal. Great article, Phyllis, and particularly informative and helpful for those of us who don’t closely follow the ins and outs of the debate but are still concerned about the outcome. I wonder how large the step is between copyrighting/ trademarking the name “Fair Trade” and then gaining the ability to legally control/ prohibit/ sanction its use. What about the activists, eaters and citizens as stakeholders in the meaning of Fair Trade? Millions of volunteer hours have been invested. Thanks for the illuminating write-up. This development seems like an instance demonstrating the inherent tension between scale of change and depth. It is evident in the compromise of politics, and the tradeoffs taken by labor organizing groups like SEIU under Andy Stern (coddling up to big business, undemocratically absorbing workers into unions, etc.). Hi, My colleague Felicity forwarded this great blog…. thanks for the really thoughtful piece Phyllis. Looking forward to chatting with Rink about it at Biofach in a couple of weeks. Let me add a few reflections from this side of the Atlantic. In the UK we 100% er’s (as we now seem to call ourselves) choose to work with the (FLO) Fairtrade Foundation licensee system. Indicators show the market has developed to a point where it is profitable for major brands to dictate market share of Fairtrade. How did we get there? Perhaps, without creation of cafedirect brand in 1991 we may have had a different outcome. For the first 6-7 years that brand was iconic. ‘Fairtrade, oh you mean like cafedirect?’ was a common part of the conversation. So we have worked to build brands within licence system. and supported the growth. Things are changing over last few years. The market category in many sectors has grown so large that these 100% brands struggle against competition. In coffee this is supermarket private label (where several now sell only FLO certified roast and ground ), in chocolate well known brands such as Cadbury (Dairy Milk) or Nestle (Kit-Kat) displace farmer owned Divine or other 100% products. In sugar it is supermarket label or Tate and Lyle , a large sugar brand. Our recent experience trying to launch Fairtrade nuts has been only partially successful as branded entry proved impossible and we then choose to go supermarket private label. After 3 years margins are slim (certainly not enough to develop small farmer supply chains) and supply is now subject to competitive tendering. Most consumers and many campaigners do NOT understand the difference between Fairtrade and Fair Trade. It is going to take several years to differentiate and I doubt if much headway can be made with the majority. If we disagree, with the FLO stratgey and choose to leave FLO licensing, we run major risk of leaving the game. We run major risk of delisting products and letting down producer partners. In the UK market you can see one version of the future of your market! Eventually, Fairtrade starts to slide down the back of the ‘economic bell curve’, value is taken out of the market in profits, price competition emerges between different social standards (e.g. FLO, IMO Social and Rainforest Alliance) . Where to the FLO Mark? The FLO system is expensive for farmers, so the other systems offer cheaper entry points for large brands! Transfair USA is perceived to be (and has been for years) both by insiders, 100%ers and producer suppliers to a bit of a loose canon or wild card and not especially part of any world wide movement. This the culmination of differences in culture and leadership, but perhaps not strategy. Whilst Jude’s suggestion (Fairtrade USA) would bring the Transfair name into line with the family of FLO and perhaps remove the obvious red flag, I fear the malaise is much deeper, and the move would not change attitudes within. 100er’s (ATOs) have always been social entrepreneurs who have a gift for survival in business. We must keep innovating and have relevant solutions to the major world problems. Poverty alleviation may have been the focus 20 years ago. This has transformed into a more complex question of climate change, food security and sustainability and of course gender empowerment. Let’s continue the innovation we began in the early 80’s!!!! PS: Phyllis, I hope you don’t mind if I tweet references to this? Thanks for this great history and reflections on what’s happening in Europe. I really couldn’t agree with you more and I applaud your reminder that yes, we must all keep innovating. It’s important to speak the truth as we see it, and fight for what is right, but above all, Alternative Trade Organizations must lead the way by continuing to put our values into practice. Thanks Andy! These statements are quite revealing about Transfair’s outlook. I think most committed Fair Traders would take issue with the idea that FT is about “poverty alleviation” rather than about empowering small farmers and artisans through co-ops and creating a viable alternative to unjust global trading regimes. Nor is it about setting some low-bar standards for “companies that want to participate” (presumably for as long as they deem their participation to be profitable and advantageous). And it is really preposterous to claim that it is their work that has delivered “more than $214 million in estimated additional income to farmers and workers through Fair Trade certification.” Last I checked, Transfair isn’t selling anything other than a seal. They have played a role in this work, but the credit belongs to the broader Fair Trade movement: producers, importers, vendors, activists, consumers, co-op leaders, etc. Some of the largest companies that Transfair certifies were openly hostile and actively working to discredit the concept of Fair Trade until committed activists brought them to the table. Now many of them consistently overstate the small portion of their goods that are certified FT, have their marketing departments come up with similar terms to confuse consumers, and splash the Fair Trade Certified mark where it doesn’t belong. Labeling is just one of the tools in the struggle to change trade. Transfair’s attempted name change takes credit where it isn’t due, and would unjustifiably have the effect of making them the standard-bearers of the movement in the eyes of the public. Here is a copy of the response I reciecved fro TransFair…I’m sure others recieved this exact same e-mail but if you haven’t take a look! Regarding your concern about our name change to Fair Trade USA, we presume your overriding concern is that FTUSA is attempting to own all of Fair Trade in the United States. We want to assure you that this is not the case. We do not presume to represent the broad movement of which we are only a part. Our collaboration with other partners in the Fair Trade movement on Fair Trade Month, Fair Trade Towns and Universities, the Fair Trade Futures conference, even Global Exchange’s Holiday Program, are examples of our efforts to build the Fair Trade movement, even with the sometimes significant differences that exist within the movement. There are several other things I would like to clarify that relate to the concerns you raise. First, the term “Fair Trade” cannot be trademarked in this country; what we have trademarked is our name, tagline and label. We feel that’s appropriate as we are the U.S. arm of the Fairtrade Labeling Organizations International. Secondly, we want to explain why we chose to change our name. We recognize that there’s a long way to go to embed Fair Trade awareness and engagement in this culture. The name “TransFair” has little or no connection to what we do, nor does the public understand the word. It’s imperative that we communicate our efforts more clearly to fulfill our mission. We’ve seen that growth in general public awareness for Fair Trade significantly increases the amount of impact dollars going back to producers. For example, Fair Trade awareness increased from 9% in 2005 to approximately 34% in 2010. At the same time, we saw Fair Trade premiums to producer community’s increase from $14 million in 2005 to $48 million in 2010. Again, we have a long way to go, and we want Fair Trade to become a household word. We appreciate your concerns and sincerely hope that this information helps to clarify our genuine support for the movement. Deb sent me the link to this article, Phyllis. I really appreciate your explaining in so much detail the history and current situation with Fair Trade. Where can I find more information about what to look for on a product that will tell how fair it really is? Great to see your comment! Your question inspired me to write a new blog post. I hope you don’t mind the mention! Yeah, I second Miriam’s question: Transfair’s label is everywhere. Is there any rhyme or reason as to which items are more or less fairly traded (Tea, Coffee, Bananas)? Specifically about the products you mention, most tea comes from plantations, including most Fair Trade tea. Equal Exchange is one of very few ATOs that are committed to building small farmer tea supply chains. At the moment, any coffee product that carries the TransFair USA or the IMO Fair for Life seals comes from small farmer co-operatives. It should be noted however, that TransFair and FLO have repeatedly tried to certify coffee from plantations. There has been so much protest, from small farmers, ATOs, and Fair Trade activists, that to date, they have not prevailed. Bananas, ahhh another question altogether. TransFair recently certified Dole bananas (and tried unsuccessfully several years back) to certify Chiquita bananas. Equal Exchange is committed to sourcing our bananas exclusively from small farmer co-operatives. and more about the issues throughout our blog. Thank you for writing such an excellent and thought-provoking article. I just wanted to correct your point on FLO attempting to certify coffee plantations. In fact, FLO has never published a standard for coffee plantations. FLO is made up of several actors (producers, LIs, staff, etc) that can and often do have very different viewpoints. Certifying coffee plantations has not garnered enough internal support, and so it’s a direction the organization has not taken. Thanks for the clarification. I apologize if my article implied that FLO has published standards for the certification of coffee plantations; that is certainly not the case. While FLO has allowed plantations into the Fair Trade system and has created new standards for these products, to date they have not done so in coffee, chocolate, and a few other products. Several years ago, it was TransFair USA which was promoting the entry of plantations into the coffee category. I was at the Specialty Coffee Association of America in Boston in 2003 when folks began getting word of this. We held an impromptu meeting (representatives of small farmer organizations from all over, Fair Trade roasters, and other committed activists) to repeat to TransFair our dismay and objection to their attempts to get plantation coffee into Fair Trade. I believe that one of their arguments was that there was not “enough small farmer coffee” to meet the demand. The meeting was heated and TransFair agreed for the time to cease this direction, in coffee. We appreciate your commentary and concern for the Fair Trade. Unfortunately, this blog post is contains numerous half-truths and exaggerations. It’s basically self-serving propaganda. This misinformation is not only damaging to the Fair Trade movement as a whole (which we do NOT claim to own), but it is extremely harmful to farmers which we all work so hard to serve and empower. Infighting does not further the Fair Trade movement. Why did you get involved in the first place? Our goal is to alleviate poverty and empower farmers in ways that are economically and environmentally sustainable. Don’t all Fair Trade organizations share a similar goal? Therefore, despite the challenge of remaining civil in a conversation based on half-truths, we feel that it is important to respond in order to clear up the facts so that we can all get back to the real work at hand: promoting Fair Trade and bringing more impact to farmers and workers around the world. –	GETTING RESULTS: Fair Trade USA partners have generated more than $220 million in community development premiums and additional income for farmers and workers in the developing world in 12 years. But that’s not enough. In 2011, we are committed to increasing our impact by including more than 535,000 farmers and workers in the Fair Trade system and delivering more than $16 million back to them. –	DEVELOPING SUPPLY: Our mission is sustainable development and community empowerment—to that end we raise 43 cents for every dollar that we spend to increase supply of Fair Trade products in the United States and further our work to build awareness among consumers—who must buy the products in order generate the money to support the farmers. To criticize our mission, you should first know what it is, and to grow the movement you must also recognize that it is contingent on having a consumer market to buy the products at sustainable prices. –	READ THIS CAREFULLY: No one can trademark ether term “Fair Trade,” nor should they! And, we’ve had a trademark on “Fair Trade Certified” for 12 years. With the most rigorous, sustainable standard available in Fair Trade, we must protect the use of our label from just the sort of defamation being tossed around as truth in these articles and press releases. –	SUPPORT FOR THE MOVEMENT: Did you know that last year, Fair Trade USA raised $1 million to support the Fair Trade Towns USA campaign—a multi-stakeholder movement that we don’t own, but rather work with two other Fair Trade groups to organize (The Fair Trade Federation and the Fair Trade Resource Network)? We also sponsored the Fair Trade Futures conference, participated in several webinars with Fair Trade Resource Network, and conducted a multi-stakeholder campaign for national Fair Trade Awareness Month in October. –	AWARENESS AND IMPACT ARE LINKED: Since 2005, our movement has experienced a four-fold increase in awareness, which corresponds directly to the amount of money that we raise for farmers. –	IMO, as a certification agency, offers an interesting approach to certification. For example they certify not only products, but company business practices, something that makes them appealing to small companies but unlikely to be effective for larger organizations. While their product certification approach might work well for small companies who are known to act in a very ethical manner, it has a few elements that can lend itself to “fair washing” if employed by larger businesses. For example, unlike the Fair Trade USA standard – where community development premiums are specified and oftentimes floor pricing as well – in IMO, all pricing is negotiated, leaving little protection for the producer. –	In addition, unlike the Fair Trade USA standard – where the producer owns the certification and once certified can sell to any buyer he chooses – in IMO, the buyer owns the certification, limiting market access for the producer. If the Fair Trade movement is designed only for small companies, IMO might work quite well, but the level of impact achieved (farmers served, extra income earned) will pale in comparison to our model. –	But as we look to provide more impact by giving more farmers and workers more access to the market opportunities provided by both small and large companies, IMO’s no price protection, buyer owns the certificate limited empowerment model is cause for concern. –	Furthermore, for many products promoted as certified by IMO, IMO does not conduct any independent verification nor pay the cost of auditing the farmers, but rather accepts the Fair Trade system’s audits. That’s not sustainable and they would not exist without Fair Trade International. –	And finally, IMO admits that it’s not a development agency. When Fair Trade farmers fall out of compliance or are not producing products of the desired quality, who helps them? Not IMO, but rather Fair Trade USA and our counterparts at Fair Trade International (FLO). The cartoons are priceless. Thanks for those. May I point out two very important pieces of information that have been lost in translation or simply ignored? These farms are Fair Trade certified by FLO-Cert. Yes, the same company that is part of Fairtrade Labeling Organization International (FLO) and the same company that Fair Trade USA is a part of. So far so good – companies all aligned with a mission to alleviate poverty and empower farmers in ways that are economically and environmentally sustainable. So, while this blog is about a name change – does it really matter who owns the name Fair Trade or whether the words Fair Trade should combined or apart when the people bothered by the name change are simply not acting fair? it is of extreme importance to discuss the issues raised. But also the producers have opinions that can be very usefull in this discusion on how to save Fair Trade both as label and above all as movement. I do attache the document of Mexican Farmers organization. El día 2 de diciembre de 2011 celebramos una Asamblea General de Coordinadora Mexicana de Pequeños Productores de Comercio Justo, Asociación Civil en la ciudad de Tuxtla Gutiérrez, Chiapas. La “Coordinadora Mexicana” está compuesta por 40 organizaciones de pequeños productores de café, miel y otros productos de una decena de estados de la República mexicana, agrupando a 25 mil familias de pequeños productores. La “Coordinadora Mexicana” además forma parte de la “Coordinadora Latinoamericana y del Caribe de Pequeños Productores de Comercio Just”, CLAC. Como parte de la agenda de la Asamblea de la “Coordinadora Mexicana” analizamos la reciente separación de Fairtrade USA del sistema FLO, el nuevo rumbo que ha tomado Fairtrade USA y las reacciones de FLO International y de otros diferentes actores del comercio justo. 1. En primer lugar nos desconcierta la decisión de Fairtrade USA de haber tomado una dirección que se aleja totalmente de la causa del comercio justo como modelo alternativo de comercio en beneficio de los pequeños productores y el desarrollo sustentable, autogestivo y democrático. El modelo de “Comercio Justo para Todos”, adoptado por Fairtrade USA, en nuestra opinión no es más que una total neo-liberalización del Comercio Justo. En este sentido lamentamos profundamente que Fairtrade USA ha dado definitivamente la espalda a los principios originales del movimiento de Comercio Justo y de las propias organizaciones de pequeños productores que son justamente las que le han dado su fuerza; a Fairtrade USA le falta conciencia política de la situación de crisis actual en el modelo neoliberal . El modelo del mercadeo neoliberal está en plena crisis y tenemos la responsabilidad de construir otro modelo: democrático, justo para todos y todas, incluyendo nuestro planeta. 2. Fairtrade USA con “Comercio Justo para Todos” está poniendo en peligro directamente la futura participación de las organizaciones de pequeños productores en el mercado de los Estados Unidos, iniciando la certificación de plantaciones privadas y posibilitando la certificación de pequeños productores no organizados. El mercado de los Estados Unidos de Norteamérica es un mercado de gran importancia para muchas organizaciones de pequeños productores de México, por lo cual el impacto de competencia desleal en esta situación puede volverse de gran gravedad. Ahora que Fairtrade USA se ha separado de FLO International y por lo tanto ya no necesita respetar la normatividad de esta última organización, tememos que finalmente Fairtrade USA baje los precios mínimos de café y de otros productos, como intentó hacer en múltiples ocasiones en el sistema FLO. Un principio básico del Comercio Justo es que los precios de los productos cubran los costos de la producción sustentable y los costos de organización democrática. Los costos de las plantaciones privadas y los productores no organizados son más bajos que los de las organizaciones de pequeños productores que respeten los principios de democracia y equidad mediante organizaciones con obligaciones y prácticas sociales. 3. Adicionalmente nunca hemos visto, ni estamos viendo ahora, que Fairtrade USA cuente con una auténtica participación representativa de las Organizaciones de Pequeños Productores en sus órganos de decisiones, por lo cual no podemos esperar ni siquiera que los nuevos criterios y reglas de este sistema tomen en cuenta las preocupaciones, necesidades y propuestas de nuestras organizaciones. 4. La separación está creando gran desconcierto y confusión en el movimiento de comercio justo y consumo responsable, y entre compradores de comercio justo en los EEUU. Muchos se sienten desilusionados y engañados por Fairtrade USA, lo cual han incluso respaldado con declaraciones públicas. Otros lamentan la división y están tomando partido por uno u otro sello, o por ninguno de los dos, no por gusto, sino más bien por necesidad. Creemos que esta brusca división está afectando en general al prestigio y la claridad política y económica del Comercio Justo. 5. Hemos visto que FLO International ha reaccionado ante la separación de Fairtrade USA defendiendo el hecho que en algunos productos, como café y miel, no se certifiquen plantaciones privadas ni se permita la producción por contrato. Esta defensa nos da mucho gusto y creemos que esta nueva actitud de FLO International debe servir para una revisión total del sistema FLO, para que regrese a sus orígenes sociales y políticas de una creación de un Mercado Diferente. Creemos que la salida de Fairtrade USA obliga a FLO International a tomar la oportunidad para hacer reajustes y regresar al camino que con tanto esfuerzo y durante tantos años hemos construido las organizaciones de pequeños productores junto con los consumidores conscientes, las empresas solidarias y también con una gran cantidad de personas dentro de las diferentes Iniciativas Nacionales del sistema FLO, comprometidas con los pequeños productores y el comercio justo como un mercado diferente. 1. De manera histórica tenemos que batallar fuertemente contra las prácticas desleales de las grandes corporaciones que van controlando cada vez más los mercados, lamentablemente también al interior del mercado de comercio justo. Tristemente hemos visto que estas grandes corporaciones además han sido capaces de sustraer grandes montos de subsidios de nuestros gobiernos, lo cual ha fortalecido su posición de dominio en el campo, desbaratando prácticamente los esfuerzos organizativos de muchos años. 2. Nos hemos tenido que enfrentar con los precios altos en el mercado, lo cual implica un problema financiero para conseguir suficientes créditos accesibles para las organizaciones de pequeños productores. No hay financiamiento que alcance y los costos y riesgos financieros son altos. Las grandes corporaciones se aprovechan de estos momentos para debilitar a las organizaciones y así desarticular a los pequeños productores, lo cual fortalece su control casi absoluto de la producción. 3. Los aumentos en los precios de combustibles y de alimentos básicos han hecho que los costos de producción y de la vida se eleven y que los aumentos de precios a nuestros productos no lleven necesariamente a un buen nivel de vida. 4. Hemos batallado con nuevas barreras tecnológicas de entrada al mercado, como en el caso de la miel donde se han tenido que construir nuevas y complejas plantas de procesamiento con certificación de inocuidad para que la miel pudiera acceder a los diferentes mercados . 5. Estamos sumamente indignados por las autorizaciones que gobiernos, entre otros el gobierno mexicano para la siembra de cultivos transgénicos a gran escala, contaminando así inevitablemente nuestros productos, para empezar la miel, de nuestro país. Los productores hemos luchado siempre contra el uso de transgénicos por cuidar el ecosistema de nuestro planeta, por proteger los cultivos nativos, por procurar la salud de productores y consumidores y para evitar la dependencia de las transnacionales que producen y patentan a los transgénicos. Esta contaminación hace que en el futuro no podamos garantizar que nuestros productos tengan (ligeros) rastros de material genético modificado. 6. Por último, los productores de todos los productos nos confrontamos con los estragos del cambio climático, tanto en nuestra producción como en nuestras comunidades. Hemos sufrido de inundaciones, deslaves de tierras, lluvias excesivas y sequías, nuevas plagas, que tanto afectan nuestra seguridad familiar, como la calidad y la constancia de nuestra producción y por lo tanto de nuestros ingresos. Por todo lo anterior hacemos un enérgico llamado a todo el Movimiento de Comercio Justo y Producción Sustentable que la lucha y división entre sellos no nos distraiga de la verdadera problemática de los pequeños productores, del campo y del medio ambiente de nuestros países y del mundo entero. Los pequeños productores lo que necesitamos es precios que cubran los costos de producción y las medidas ambientales y una economía realmente justa para que los productores puedan seguir trabajando para vivir dignamente y que puedan seguir jugando el papel de salvaguardas del medio ambiente y de proveedores seguros de alimentos sanos para la población mundial. Nuestras organizaciones de pequeños productores sólo podemos avanzar con un auténtico comercio justo y la producción sustentable u orgánica. Estamos haciendo y haremos todo lo que está en nuestras manos y sin descanso para que los consumidores y las empresas solidarias se sigan sumando a nuestra causa. Sabemos que contamos con muchos aliados en este camino y confiamos en que juntos logramos cumplir con nuestra misión. Coordinadora Mexicana de Pequeños Productores de Comercio Justo, A.C.
so as to share it with our non-spanish speaking readers.